My reign as Miss Ghana Canada thus far has been a great experience. I've had the privilege to meet with many interesting people and attend important events in the community. It has been a fast paced, exhilarating 7 months. 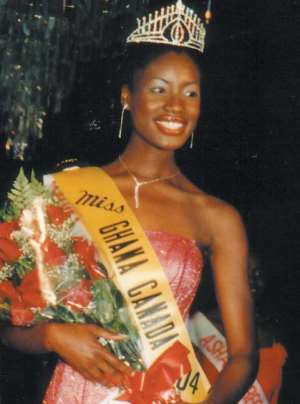 Being crowned Miss Ghana Canada has come with a huge burden and responsibility. It's been filled with surmountable situations. I have had to balance my full-time studies in Kinesiology at York University, working part-time, volunteering and fulfilling my queenly duties as Miss Ghana Canada. So I've had to really exercise my time management skills. It's been a lot of pressure on my shoulders and I've had to face many new challenges. Yet despite it all it's been a fun, privileged year. I have had the opportunity to meet many interesting people and celebrities and help be a positive role model in the community. My first event in September was attending the Miss AfriCanada pageant. I attended the Miss Black World Canada on October 26th, where I helped to give away many prizes. I also got to meet with celebrities like James Avery and Freddie Jackson. I also had the privilege of attending the Mini Miss Canada pageant. Every one of those pageants brought a nostalgic feeling for me. I've also received the honor of hosting a numerous amounts of events in the black community. I have attended the Ghanaian Canadian Achievement Awards where I helped to give out awards. On the 9th of November I hosted the Shreka Africa event held at the Jamaican community center. It was a fundraiser for a Christian mission to Kenya to help the children there. I had the honor of meeting the first lady of Ghana, Miss Theresa Kufour at the Mother and Child Foundation. I also hosted the annual fundraiser for the Humber River Hospital foundation where I was able to help raise over 2,000 dollars for the hospital. I am currently co-hosting Celluloid City at CHRY radio station and this has allowed me to meet with celebrities like Mark Taylor from Drop the Beat. I also attended the 47th annual Ghanaian Independence Day celebration where I gave out awards. It's been a whirlwind of going from one event to another and now I am planning to go to Ghana and continue my pageantry duties there, after my exams. I am part of the Ghanaian association at York University and have helped at the multicultural weekend event to raise awareness about Ghanaian Heritage. This has been a blessed 7 months and I have enjoyed the challenge of my reign. One thing I have learned throughout my reign is what it really means to be a beauty queen. It's not all glamorous, it's a lot of work, time and commitment and maintaining a positive attitude is imperative. My education is very important to me and it takes priority over all things. I am still pursuing my goal to become a medical doctor. My message to the youth is to take your education seriously, it is the leverage you will need in life to get ahead and be successful. A lot of doors had to be broken down for blacks to be allowed to go to school and the youth of this generation should make use of the chance we have been given. We have to focus and filter out all the negative distractions in this day of age and aim for higher things in life. My message to parents out there is to love and support your children. They are in desperate need of some love and attention, when youth act out in negative ways it's a cry for attention. Everyone is capable of love and we must give it freely and unconditionally.